This is the first time in history when five generations of employees may co-exist in the workplace: the Silent Generation, Baby Boomers, Gen X, Millennials or Gen Y, and Gen Z. At the same time, older employees are delaying retirement while Gen Z, the generation we know the least about, is making their first appearance in the workplace. The Internet and bookstores are full of writings by psychologists, sociologists, and human resource specialists about the differences between the generations. According to them, The Silent Generation likes stability and order and hates to take risks. Baby Boomers are ambitious and materialistic. Gen X is self-reliant and cynical. Millennials are self-confident and achievement-oriented. And, Gen Z is tech-dependent and big on multi-tasking. The problem with such generalizations is that there are always those that don’t fit neatly into a category. Instead of putting people in boxes, the new workplace can break down hierarchies, encourage collaboration and communication, and instill a shared sense of purpose and promise. Today’s savvy CEO should understand potential communication, work-style, and motivational differences that may exist between employee populations, but focus on creating a work environment that will keep all employees happy, productive and healthy. Harping on generational differences just preserves stereotypes and creates division. Instead, the focus should be on building common ground that gives all employees a choice in how and where they want to work, and in adding elements to the workplace that make everyone feel valued and part of a larger whole. Research on the dynamics of the workplace points out that only one in four U.S. workers feels they are currently in an optimal workplace environment. 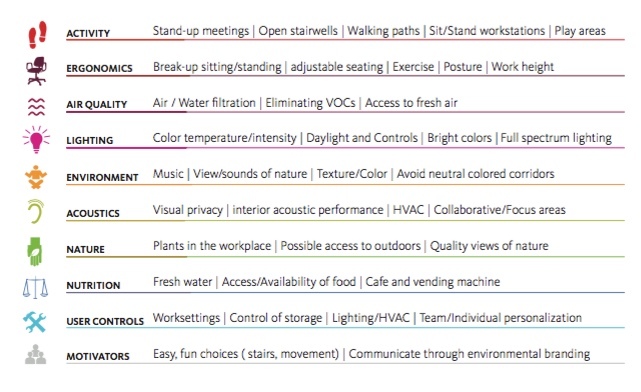 There are 10 design factors that can increase employee engagement: activity, ergonomics, air quality, lighting, restorative environments, acoustics, nature, nutrition, user control and motivators. Let’s talk about acoustics for a moment. All human beings with normal hearing are distracted by noise. Noise is one of the reasons older workers have clung to private offices. But, even in a 100 percent open work environment, designers can plan to minimize noise. They can locate workstations away from major gathering areas. They can improve HVAC acoustic performance. They can provide quiet zones for focus work. They can include sound-absorbing ceiling panels and fabrics. Workers that grew up plugged in to earbuds and headphones may opt to add those to handle distraction, but a good design can largely mitigate this issue. All workers want to feel part of a company that they can be proud of – one with products, goals, and aspirations they think are worthy. Adding branding elements into the workplace that underscores corporate goals and improves employee engagement creates a sense of place that is distinct and meaningful. The experts say a branded workplace is particularly important to Millennials, but the argument could be made that this is a universal human need that spans the generations. Another big differentiator in employee engagement and success is communication. The generations may differ in the way they communicate – face-to-face, email, Snapchat – but all effective workplaces are environments that support the free-flowing exchange of information. The best offices have intersections where people meet informally. Great workplace designs encourage people to get up from their desks and move around. They also provide the technical infrastructure to enable people to work where, when and with whom they need to, seamlessly. Much of the tension between the generations can be dissipated by talking to each other. Intersection and interaction are important. Creating a more transparent workplace where people can see the work of other teams, experience different jobs within the organization, and have access to mentors of all ages adds a layer of richness and connection to the environment. It also encourages continuous learning and development. Creating a strong corporate culture valuing individual and team accomplishments, providing employees with a healthful work environment offering group and individual work areas, and embracing cultural and generational diversity will boost employee engagement, profit, and employee retention. Dean Strombom is a Practice Area Leader in Energy and Landlord Services in the Houston office of Gensler, where he leads the planning and design of corporate campuses, commercial office buildings, workplace interiors and mixed-use developments. Dean is on the advisory board of the University of Houston Graduate School of Real Estate at the Bauer College of Business.